I selected a Table Rate, but cannot see table rate premiums in the results. Our Agency Life Quoter Allows you to compare Health Categories. You can view Standard and Substandard rates in the same quote results. Our quote engine is unique because we do think you should need to click two checkboxes, to run a single health class. 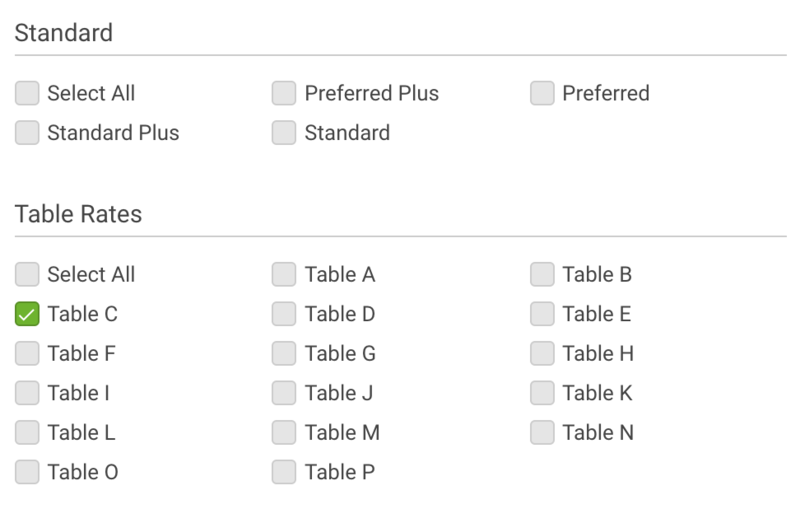 This means that you do not need to select "Standard" in order to quote a table rated premium. If you selected both "Standard" and a table rate in your quote criteria, your quote results will show quotes for two different health classes. No worries though! If you'd like to see the table rates, either scroll down to find them in the quote results or use the "Health Category" filter at the top of the Quote Results to display quotes based on health categories.